It's essential that scaffolding is thoroughly inspected by a competent and experienced professional to ensure structural stability and safety. A scaffold inspection performed by Access Design & Safety is as comprehensive as possible. We perform a thorough series of checks to determine the stability of the scaffolding and whether or not it is fit for purpose. It begins with a customer liaison to ensure that we understand the design and goal of the project implicitly. Then our team of qualified and experienced personnel begin the process of inspection. 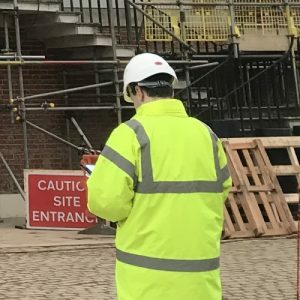 Over the course of the inspection we take notes and measurements in order to gain the best possible picture of the overall condition of the scaffolding. Then, we compile that information into a full report which we walk through with our clients. This ensures everyone is on the same page - we make sure they understand the current state of their construction, and we can make suggestions for improvements based on our extensive experience. Call Access Design & Safety today for an all-important thorough and professional scaffolding inspection.